Every Saturday at 9:30 pm and repeat telecast every Tuesday at 3pm. 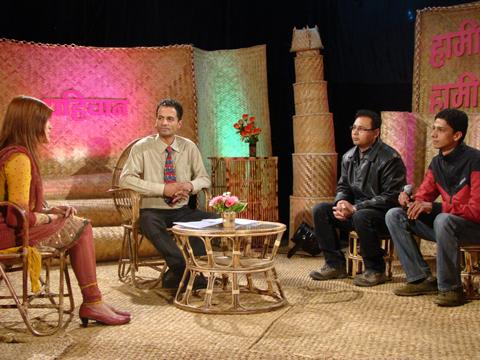 Sunil Babu Pant is hosting a new TV show every week(Saturday) at 9:30pm on Nepal’s national television, “Nepal Television”. The repeat telecast of this program can be viewed every Tuesday at 3pm. Pahichaan, which in Nepali means “identity,” features Nepali celebrities who join Pant each week to discuss their lives and careers, and the importance of supporting human rights for the LGBTI community.